Look, it’s not easy to make people laugh…and sometimes, after it feels like you just can’t land a joke, it’s easy to crack! But you, friend, seem to have taken the ol’ classic comic bomb into a severely troubling direction! So yeah, we won’t call you a jester anymore and will only stick to Jingle Jangle, since you’re pretty keen on living this new killer life. And if this is the route you want to take, then we gotta say: At least you’re trying to do it right! 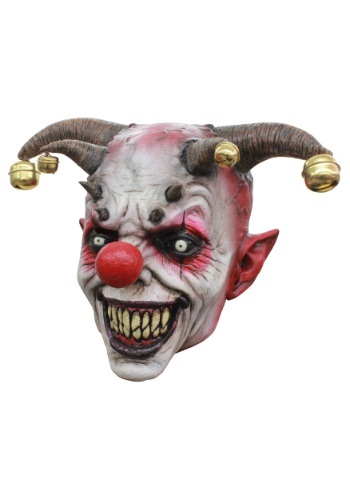 That Jingle Jangle Clown Mask with molded latex that covers your entire head is severely creepy, and super detailed (is that hand painting we see? Very nice!). It’s good to see that you’re taking care of your oxygen intake with the holes in the eyes, nose, and ears, and the bells…man, those bells. If we even hear a hint of those high-pitched ringing of bells, we get a serious urge to take off running. Nice touch! Also, at some point, we should really sit down and talk about your mental health, but it looks like you could use some quiet time on your own, so we’ll catch you at the comic book store later, ya joker!